The Paris Agreement on climate change and the 2030 Agenda for Sustainable Development represent a global turning point towards a low-carbon, climate resilient, prosperous and equitable future. But for these ambitious agendas to flourish, there needs to be an integrated approach to implementation at the national level. Approaching implementation in an integrated way at the national level can enable sharing of information and data instead of creating unproductive silos, determine more cost-effective pathways for domestic and international finance, and avoid locking in high-emissions policies. To help decision-makers bring about this integration, Climate Watch  presents the first ever global tool to find links between the actions communicated in countries’ nationally determined contributions (NDCs) and the Sustainable Development Goals (SDGs) and associated targets of the 2030 Agenda for Sustainable Development. Initial WRI research  found that climate actions in the NDCs align with 154 of the 169 targets of the SDGs. Climate Watch puts that research into the user’s hands, enabling the exploration of the thousands of links between individual NDCs and SDG targets – right down to identifying the actual text in the NDC. Knowing which climate targets and actions in the NDCs can help deliver on the achievement of the SDGs, and vice versa, is an essential entry point for implementation of both agendas. The Climate Watch database allows users to identify alignments with NDCs and to start a conversation about how to optimize those intersections. With an overwhelming number of SDG targets (169 in total) and 165 incredibly diverse NDCs, there has been no easy way to identify points of alignment at the global, regional or individual level. 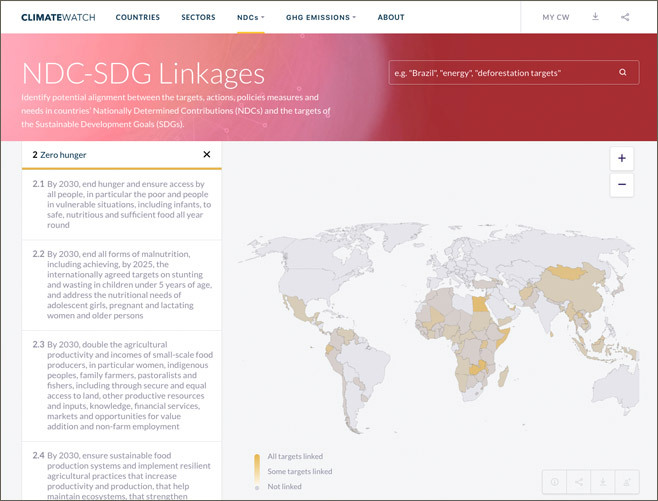 Now through Climate Watch, the Global Linkage Map  enables users to search across all goals and targets of the 2030 Agenda and the text of all NDCs. This is particularly useful to understand country priorities, as well as opportunities for new partnerships or investment at the nexus of core climate and sustainable development priories. For example, the eradication of hunger by 2030 (SDG2) will require food systems to become more sustainable and resilient to climate impacts. 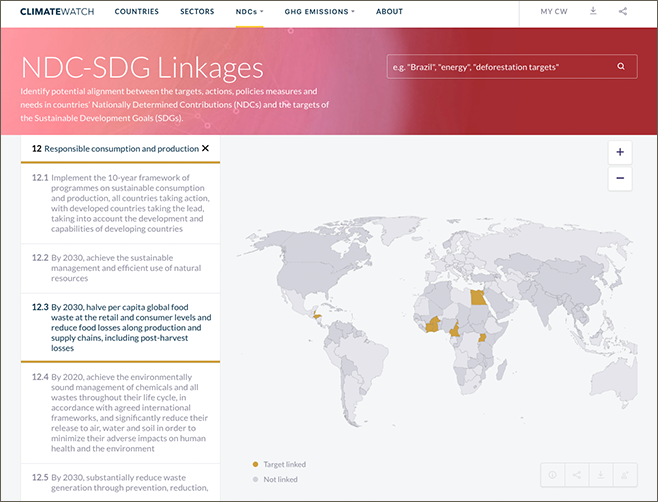 Those looking to create or strengthen coalitions and initiatives at the intersection of food production and climate can identify NDCs that contain relevant climate targets or actions by using the Global Linkage Map and filtering to SDG2 and the associated targets. From here, users can select countries and go directly to the relevant text of the NDC. Identifying where national priorities for sustainable development and climate align represents a significant challenge for many countries. Undertaking such a mapping exercise is the foundation for effective and sustained implementation. The Country Pages  on Climate Watch provide a starting point for this mapping exercise - revealing the links that are apparent from the text of the NDC. Highlighted dots indicate alignment with at least one climate action from the country’s NDC. This mapping provides a useful starting point for countries in identifying how relevant ministries could collaborate and pool resources to achieve aligned targets in a synergistic manner. For example, Uganda’s NDC presents opportunities for collaboration between the Ministry of Health and the Ministry of Water & Environment on priorities that could deliver both mitigation and adaptation while improving local communities’ health and well-being. In the process of translating the Paris Agreement into implementation, countries have the opportunity to review and update their NDCs by 2020. Climate Watch enables policymakers to identify opportunities to enhance their NDC through greater alignment with national sustainable development priorities or trends globally. For example, SDG target 12.3 aims to halve per capita global food waste by 2030. Around a third of all food produced  for human consumption is lost or wasted , resulting in approximately $940 billion  per year in economic losses, food insecurity and an estimated 8 percent of global greenhouse gas emissions. Fourteen countries have already included explicit commitments in their NDCs that could contribute to the achievement of 12.3. In their 2020 NDCs, countries could consider making these links more specific or adding in new commitments aimed at achieving and/or capturing the mitigation impact of reduce food loss and waste along the value chain. For example, the National Food Waste Reduction Strategy recently proposed  by Canada, could lead to additional opportunities to strengthen Canada’s NDC and be a catalyst for further reductions across the public and private sector. Climate Watch is a global development tool for climate and sustainable development; it offers an entry point for exploring where and how the current NDCs align with the SDG targets of the 2030 Agenda. The linkages identified in Climate Watch are based on what was clearly communicated in an NDC and therefore don’t reflect the many links with national policies or measures that are not currently captured in the NDC or the sometimes unstated ways that actions in an NDC could provide benefits for achieving the SDGs. This suggests the enormous potential for further analysis at the national level as countries move forward with their implementation plans. Only through a deeper and more comprehensive understanding of the links between these two agendas will it be possible to fully unlock future ambition and enable truly transformational approaches that address the underlying barriers to a zero-carbon, climate resilient future.